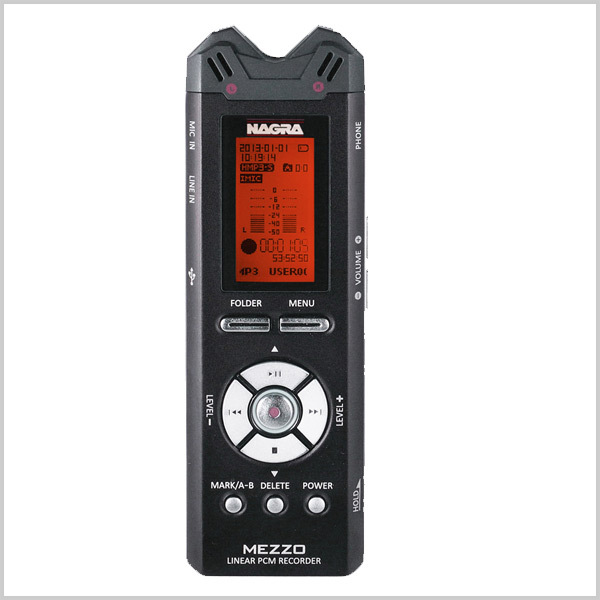 High quality solid-state audio recorder, the Nagra MEZZO is designed to be used in any ultra-portable recording situation. It records to an internal 8GB flash memory. 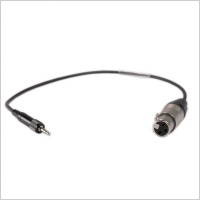 It records PCM Mono or Stereo audio wav files at up to 24 bits 96 kHz sampling rates, as well as MPEG compression MP3 for longer recording times. The unit is powered by two “AA” batteries, offering in excess of 40 hours operation. It offers an automatic gain control system, a noise cut low frequency attenuation input filter and VOR (Volume Operated Recording). 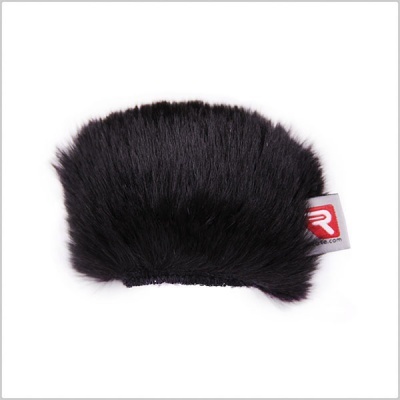 It is equipped with an extra high-quality playback amplifier. 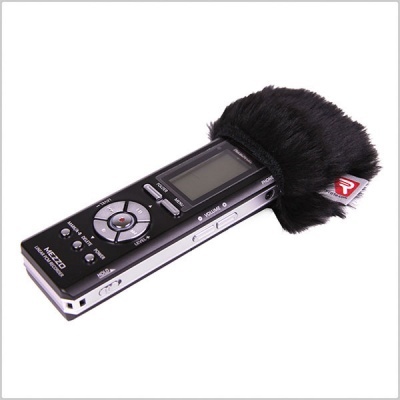 Very easy to operate and comfortable in-the-hand the MEZZO is an ideal pocket sized recording device. 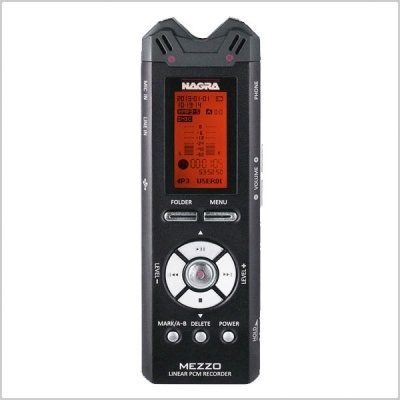 Designed for radio journalist applications, and other hand-held recording opportunities the Nagra MEZZO offers instant start-up, one button recording, automatic level control, internal loudspeaker and a low cut filter. All machine settings are programmed through the comprehensive menu system, where many features of the recorder can be adapted according to the users requirements. The Nagra MEZZO has a miniature USB 2.0 port. Through this connection, the internal memory appears on the “desktop” as a mass storage device (external drive) of the PC / MAC and requires NO additional software or drivers. 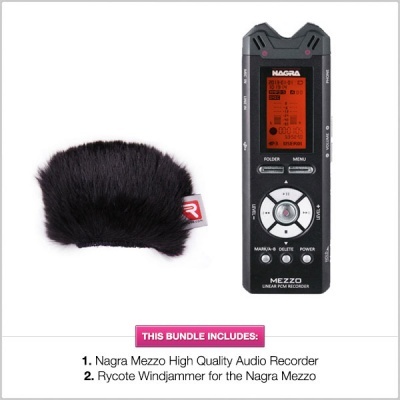 A combined Windshield and Suspension solution, the kit contains everything needed to protect a handheld digital recorder from outdoor wind noise, and also to isolate it from unwanted vibrations, whether from handling or stand-borne noise. It is aimed at journalists, film-makers, or anyone using a handheld digital recorder to make professional-quality audio recordings outdoors. 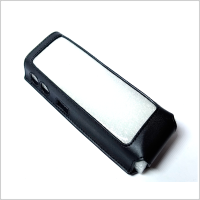 It can be used on location soundtracks or outside broadcast, or for simple audio podcasts or outdoor radio reporting. ActionPod® is a clamping monopod that is genius in its simplicity, providing the quickest, easiest mounting solution on the market. Utilizing a clamp, a threaded top and a single length-adjustable arm, the camera mount removes the complexity of tripods while providing stability and micro-adjustability for your GoPro®, SONY® ActionCam, point-and-shoot or small video camera. ActionPod® is surprisingly stable and may be mounted virtually anywhere: trees, bike frames, skateboards, car doors, ski-poles, backpacks, motorcycles... when you think of a thrilling new angle, ActionPod® is there to get you the shot! 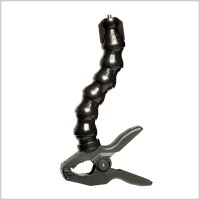 The 5-link, 7” long arm is micro-adjustable, allowing you to frame each shot perfectly. 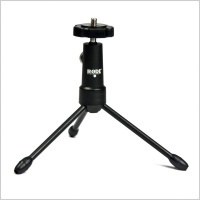 The strong spring clamp ensures a solid, yet quick to position base that can be moved using one hand. ActionPod® also works with any small device up to 3 lbs that is equipped with a ¼-20 (camera-type) thread: camera flash units, radar detectors, GPS units, on-board lights etc.